Islam teaches injustice? The religion with Allah is Islam; and Islam teaches justice to the highest levels. This is because it is Allah who set the laws and He is the Best of judges. People often confuse equality with justice. 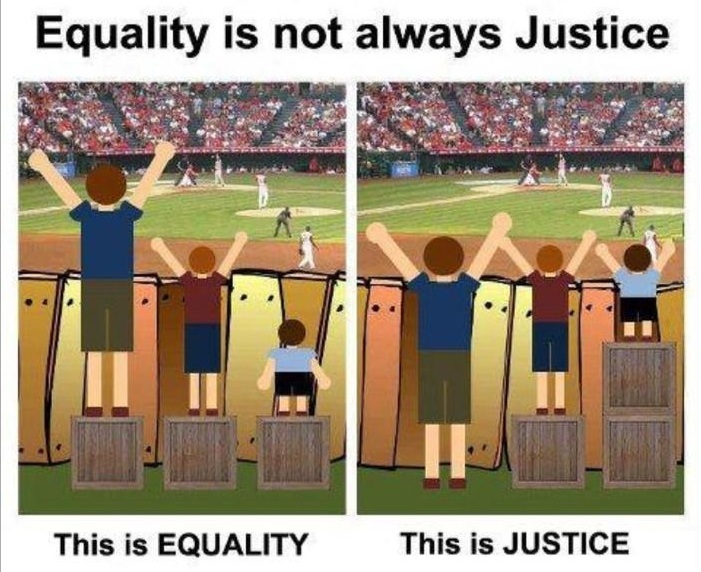 Equality is not always justice as can be seen in the image below. If there are only three boxes and three people of different heights and they all want to watch a soccer match at the same time; what would you do? If you give them each one box, it is equality but not justice. The shortest one has to have two boxes and the middle height man has to have one; and hence we have justice. Please note that sometimes equality can be justice but not all the times. People who think equality and justice are the same; think and say there is no justice in Islamic laws. Let us look at Islamic Inheritance laws as an example; people want equality which is okay but as we stated equality doesn’t necessarily mean it is justice. For example a father with two sons and no other relatives, passes away; the sons will inherit equally. But if the father had one son and one daughter; the son would get 2/3 and the daughter 1/3 of the inheritance. The son needs to look after his sister in reasonable means and so he has to have more and if he marries he will also his wife and children to look after; but the daughter does not have all the responsibilities his brother has and hence she has 1/3. Everything Allah tells us to do is justice because He is the Most Wise and All-Knowing while we have been granted very little knowledge. Is not Allah the Best of Judges? The media is doing a great job of making Muslims look like terrorists as usual. In its broadest sense, terrorism is any act designed to cause terror. The media is like the Magicians of Fir’aun showing falsehood and causing terror to people who know nothing about Islam. There are many kinds of Magic and the media is using the Magic of showing the bad which is not Islam, distorting/hiding the good of Islam. It’s just one of the many Magicians tricks. The Magicians want to present Islam as a religion of terrorism while it is not? It is our job as Muslims to ensure we stand firm as Musa did so that the truth can be confirmed by Allah’s permission. Islam is being given a bad image by those who reject truth. Allah will deal with them in the Day of Judgement if they don’t repent and do righteous good deeds. Even the Magicians of Fir’aun said the same things; does this sound familiar to the Ayat below, “These Muslims are a threat to homeland security”. Nouman ali khan, “Please pounder for a moment, this is the same Fir’aun who in other places in the Quran says don’t I alone exclusively own the dominion of Egypt and these rivers flow beneath my feet. Fir’aun used to speak about the Kingdom of Egypt for himself exclusively. But when he saw that Musa’s Message is gaining power and people are actually starting to listen; he couldn’t tell people don’t listen cause he will take away my land; he had to change the narratives and say, no he is not a threat to me, he is a threat to your land, this is your land too. We are all in this together. They weren’t in this together before. So if you really love your land and its part of you and you have any sense of patriotism; then part of your patriotism will be to hate this Message. You can’t love or consider this message because that would mean being a traitor to your own country. So the narrative is made that either your love your country, your people, your tribe, you love your glorious history and past or you consider Islam because the two can’t go together in this highjack narrative.